Working life in Poland - key characteristic of working life across a range of parameters. According to Eurofound’s European Quality of Life Survey (EQLS), both life satisfaction and happiness have increased in Poland during the years of observation. Average life satisfaction increased from 6.2 in 2003 to 7.2 in 2016, being slightly higher than the EU28 average of 7.1 (on a scale of 1–10). Similarly, happiness increased from 6.9 in 2003 to 7.5 in 2016, being also slightly above the EU28 average of 7.4. In line with these findings, the share of respondents reporting difficulties in making ends meet has decreased in Poland, from 72% reporting difficulties in 2003 to 39% in 2016. Respondents in Poland are also more optimistic than the European average. In 2016, 71% of respondents in Poland were optimistic about their own future, higher than the EU28 average of 64%, and 77% were optimistic about their children’s or grandchildren’s future, also above the EU28 average of 57%. Work–life balance related problems are relatively more frequent in Poland than on average in the EU. For instance, in 2016, 63% of respondents in Poland were too tired from work to do household jobs at least several times a month, compared with 59% for the EU28. Furthermore, in 2016, 50% of respondents in Poland experienced difficulties to fulfil family responsibilities because of work at least several times a month, significantly higher than the EU average of 38%. The least common work–life balance problem was having difficulties to concentrate at work because of family responsibilities, reported by 28% of respondents in Poland in 2016, but still higher than the EU28 average of 19%. Perceived tensions between poor and rich people have decreased in Poland, from 52% of respondents reporting a lot of tension in 2003 to 29% in 2016. This figure matches the EU28 average, which was also 29% in 2016. However, perceived tensions between different racial and ethnic groups have increased, from 19% of respondents reporting a lot of tension in 2007 to 28% in 2016. Despite this increase, this type of tension is not as common in Poland as on average in the EU (41% in 2016). Furthermore, 45% of respondents in Poland felt safe when walking alone after dark in 2016, which was significantly higher than the EU average of 35%. The perceived quality of many public services has increased in recent years in Poland. For instance, the perceived quality of health services has increased from 4.7 in 2011 to 5.4 in 2016, advancing towards the EU28 average of 6.7 (on a scale of 1–10). Similarly, the average quality rating for the education system increased from 5.9 in 2011 to 6.7 in 2016, the same as the EU28 average of 6.7. The state pension system received the lowest quality rating in Poland of 4.4 in 2016, although this is an improvement from a level of 3.4 in 2011. This profile describes the key characteristics of working life in Poland. It aims to complement other EurWORK research by providing the relevant background information on the structures, institutions and relevant regulations regarding working life. This includes indicators, data and regulatory systems on the following aspects: actors and institutions, collective and individual employment relations, health and well-being, pay, working time, skills and training, and equality and non-discrimination at work. The profiles are updated annually. In Poland, 2018 saw a deepening of the crisis in tripartite social dialogue, which had already begun to unfold in 2017. As in the previous year, no single substantive tripartite resolution was taken – only procedural ones. Even though there were many debates, information exchanges and consultations within the Social Dialogue Council (RDS), there was a noticeable decrease in the level of debate on significant topics, with numerous issues being discussed only in thematic teams. The number of bipartite resolutions fell dramatically as well. Although amendments were made to the social dialogue legislation – with several new prerogatives added and the number of representative social partner organisations enlarged – these could not overshadow the fact that RDS was looking more and more like its predecessor, the Tripartite Commission, in its final years. While social dialogue was weakening, tensions in labour relations in the public sector accumulated to the point where large-scale conflicts broke out, the government being the main addressee. Pay demands were made by teachers, members of the police and other uniformed services, employees of the National Fiscal Administration and administrative staff of the judiciary. This was hardly surprising, given that the ‘pay freeze’ for the ‘national budgetary sphere’ – which encompasses all positions remunerated from the state budget – had remained in place since its introduction in 2010 by the previous government. With the labour market in good overall shape – as was reflected in an unemployment rate of under 4% and rising public sector wages – pay pressure in the public sector was rising towards the end of the year. Between 2012 and 2017, Poland’s GDP had robust growth of 18%; the EU average for the same period was 7.4%. During this time, unemployment rates decreased in all categories, and in 2017 total unemployment stood at 4.9%, below the EU average for that year (7.6%). Employment figures were a few percentage points below EU averages for all categories, with total employment increasing 3.1% in 2017, while the EU average was +1.7%. The Labour Code (Kodeks pracy) regulates the rights and duties of employees and employers in Poland. There were no major reforms of the Labour Code in 2017. In 2016, the amendments to the Labour Code set the grounds for eliminating the ‘first day wage syndrome’: employers are obliged to sign an employment contract prior to the employee commencing work. Previously, a contract had to be signed by the end of the first day of work, and some employers (or their onsite representatives) abused that right. In 2015, the Labour Code was amended: the maximum number of consecutive fixed-term employment contracts was limited to three, and their combined length to 33 months (adding a three-month trial period, any employee can work on the basis of a contract of limited duration no more than three years). Trial period employment contracts were recognised as a separate type of employment contract. Employment contracts made for a period of completion of a specific assignment were abolished from the Labour Code. Industrial relations and social dialogue in Poland are regulated by the Labour Code, the Trade Unions Act (Ustawa o związkach zawodowych), the Act on Employers’ Organisations (Ustawa o organizacjach pracodawców), the Act on Resolving Collective Disputes (Ustawa o rozwiązywaniu sporów zbiorowych) and the Act on the Social Dialogue Council and other social dialogue bodies (Ustawa o Radzie Dialogu Społecznego i innych instytucjach dialogu społecznego). The latter was passed in legislation in the summer of 2015. Industrial relations in Poland can be described as a blend of pluralism, neo-corporatism and etatism, which is reflected in the variety of labels employed, including ‘illusory corporatism’ (Ost, 2000), ‘pluralism’ (Meardi, 2002) or ‘fake corporatism’ (King, 2007). For Bechter, Brandl, and Meardi (2012) Poland (similar to other countries in Central and Eastern Europe, CEE) is a ‘mixed’ or ‘empty’ case. Polish industrial relations combine a high level of collective bargaining decentralisation with the relatively weak institutions of social dialogue at the national level (the Social Dialogue Council, RDS and previously the Tripartite Commission on Social and Economic Affairs, TK) and underdeveloped industry-level collective bargaining. Most collective bargaining takes place at the company level. Weak density affects both trade unions and employers’ organisations. For many years there has been an important political divide between trade unions, reflecting their communist and anti-communist past. ‘Competitive pluralism’ (Gardawski, 2003) of trade unions reflected their fragmentation and inter-union competition. The state plays an important role in Polish industrial relations. First, it is an important employer, as 22.5% of employees still worked in the public sector in Poland in 2015. Second, national legislation remains the basic reference point for setting minimum wages and working conditions for most employees in the private sector as well due to limited collective bargaining coverage at all levels. Third, the state authorities play a crucial role in the tripartite social dialogue at the national and regional level. In June 2015 the new legislation re-establishing tripartite social dialogue system in the country was adopted, and in October new tripartites bodies began operations. Meanwhile, radical political change took place in Poland: following a victory of Andrzej Duda in the presidential elections in June, in October his former party, the major opposition force, Law and Justice (Prawo i Sprawiedliwość, PiS) won parliamentary elections, securing majority of seats in both chambers. The new government’s initial phase of operations was marked by a number of pro-employee changes in the legal environment (see above) and relatively high attentiveness of the government to tripartite consultations. However, in 2017 there were a number of symptoms suggesting the return to the former government selective approach to tripartism, marked by avoiding or disregarding tripartite consultations, whenever it was seen as an obstacle to the fulfillment of governmental policy objectives. Trade unions, employers’ organisations and public institutions play a key role in the governance of the employment relationship, working conditions and industrial relations structures. They are interlocking parts in a multilevel system of governance that includes European, national, sectoral, regional (provincial or local) and company levels. This section looks into the main actors and institutions and their role in Poland. The Ministry of Family, Labour and Social Policy (Ministerstwo Rodziny, Pracy i Polityki Społecznej, MRPiPS) deals with social dialogue issues (through a special department) and provides infrastructure (premises, organisational and technical support) for tripartite social dialogue at the national level (Social Dialogue Council, RDS) and for sectoral social dialogue bodies (in most cases, the committees are affiliated to the Ministry). The Ministry also maintains a register of works councils and multi-employer collective labour agreements. The Ministry is also responsible for discussing new labour law regulations proposed by the government with social partners. The National Labour Inspectorate (Państwowa Inspekcja Pracy, PIP) is a central administration body (headed by the Chief Labour Inspector, appointed by the parliament) responsible for monitoring the state of observance and enforcing the labour law. PIP is supervised by the Labour Protection Council (Rada Ochrony Pracy, ROP). In particular, PIP’s prerogatives concern the observance of employee rights; the observance of health and safety regulations; legality of employment; and provision of assistance and advice to citizens in matters related to the labour law. At the voivodeship (regional) level there are District Labour Inspectorates (Okręgowe Inspektoraty Pracy, OIP), whose duty (besides the abovementioned) is to register new and amended single-employer collective labour agreements. Labour inspectors carry out their duties by preventative actions (disseminating knowledge, promoting health and safety at work, advising employers and employees) and workplace audits (on- site control and indirect inquiries). There are two categories of audits: routine and intentional (scheduled), aimed at inspecting specific sectors or enterprises. The labour courts are separate and autonomous organisational units of general (local, district and appeal) courts of law, responsible for hearing and ruling on labour-related matters (employment- and employment relationship- related claims; claims related to other legal relationships to which labour law regulations apply; determining whether an employment relationship exists; settling damages in cases of work-related accidents and occupational diseases). In labour courts, there is a two-step procedure. The Ministry of Development (Ministerstwo Rozwoju, MR) is involved with institutional social dialogue to some extent, as certain multilateral bodies (such as the Inter-ministerial Committee for Europe 2020 Strategy-related Issues or the Inter-ministerial Committee for CSR-related Issues) have been affiliated to the Ministry since 2015. The Centre for Social Partnership ‘Dialogue’ (Centrum Partnerstwa Społecznego ‘Dialog’) is a state-controlled institution responsible for promoting social dialogue (through instigating and maintaining public debate, research and publishing activities). with at least 300,000 members that covers entities pursuing operations in least half of all sections of the Polish Activities Classification (PKD), yet no more than 100,000 members employed in a given PKD section can be counted. 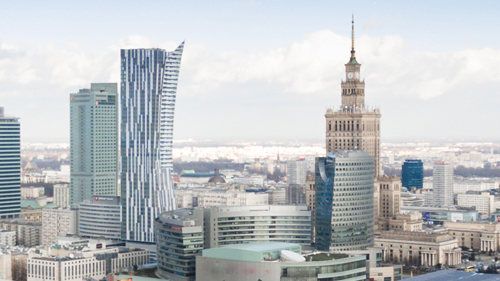 member entities pursue operations in at least half of all sections of the Polish Activities Classification (PKD), yet no more than 100,000 employees can be counted for each section. The Trade Union Act of 1991 grants the right to establish trade unions to employees, that is, people working on the basis of employment contracts. Other larger categories of workers excluded from union membership are judges, civil servants in state administration, professional soldiers and functionaries of the Office for State Protection (Agencja Bezpieczeństwa Wewnętrznego). There are also specific categories of people active in the labour market that do not enjoy the right to establish trade unions but are eligible to join existing union organisations, including pensioners and the unemployed, teleworkers and people employed in the outwork system. There are also special regulations concerning trade union membership for police officers, border guards, prison guards and the State Fire Service as well as employees of the Supreme Chamber of Control. Due to a narrow definition of the right to association in the Act, self-employed people and those working on the basis of civil law contracts are not eligible to join or organise trade unions. As a minimum number of 10 employees is required to set up an enterprise-level union, those in micro firms (around 40% of all employees) are effectively excluded too. Following the sharp wave of deunionisation in the 1990s, trade union density in 2004 stood at 21.5% (according to OECD data). According to the last survey of the Public Opinion Research Centre (Centrum Badania Opinii Społecznej, CBOS), trade union density in 2014 amounted to 12%. ** Authors’ own calculations based on the CBOS reports . 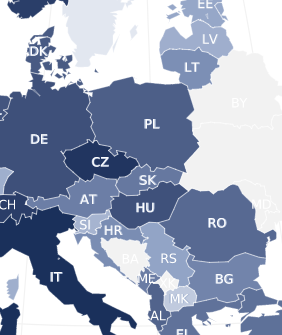 A total of three trade union organisations in Poland meet the criteria of representativeness at the national level (see below) and participate in the Social Dialogue Council (RDS). These are the Independent Self-governing Trade Union Solidarity (NSZZ Solidarność), the All-Poland Alliance of Trade Unions (OPZZ) and Trade Unions Forum (FZZ). No major organisational changes within the trade union movement took place in the last three years. Since 2013, there has been an unprecedented level of cooperation among the three major trade union confederations. The three unions first took a unanimous decision to abandon social dialogue at the central level. They subsequently launched a campaign against the government policy and cooperated together in the preparation of the Tripartite Commission reform proposals. Trade unions were the major architect of the new tripartite social dialogue legislation adopted in 2015. In May 2014, OPZZ held their eighth congress and celebrated their 30th anniversary. Jan Guz was re-elected as chairman of OPZZ for the third consecutive time. In May 2014, the FZZ held its fourth national congress and re-elected Tadeusz Chwałka as president of the union. In early October 2014, NSZZ Solidarność held its 27th national convention and re-elected Piotr Duda as the chair for another four-year term. In November 2015, following the sudden death of Tadeusz Chwałka, Dorota Gardias (of the nurses trade union) was elected the FZZ Chair. Any employer can join an employers’ organisation. Employers’ organisations have not been developing particularly fast in the recent years, although last year the Employers of Poland (Pracodawcy RP) reported a massive increase in the volume of aggregate employment of their associated employers, claiming the figure amounts to some 5 million people (working for approximately 10,000 employers). In 2012, the confederation disclosed that some 4 million employees worked in their member companies in total. Therefore, it is difficult to assess the current employers’ organisation density. There are four nationwide employers’ organisations that have seats in the Social Dialogue Council (RDS): Business Centre Club (BCC), Confederation Lewiatan (Konfederacja Lewiatan), Employers of Poland (Pracodawcy Rzeczypospolitej Polskiej, Pracodawcy RP) and Polish Crafts Association (Związek Rzemiosła Polskiego, ZRP). The information on involvement in collective bargaining is gathered through the authors’ own monitoring activities. In 2015, the institutional framework for tripartite social dialogue fundamentally changed. At the central level, the main body is the Social Dialogue Council (Rada Dialogu Społecznego, RDS) The RDS members are government representatives appointed by the prime minister, and representatives of trade union confederations and employers’ organisations that are representative at national level. Eleven thematic teams operate within the Social Dialogue Council. The teams deal with topics of cross-sectoral social dialogue, such as state economic policy, labour market, labour law, social insurance budget, wages and social benefits. There are also 13 Tripartite Sectoral Committees, which play an advisory role for the government on issues related to the problems of particular branches of the national economy. At the regional level, the regional councils of social dialogue (wojewódzkie rady dialogu społecznego, WRDS) serve as tripartite social dialogue institutions, which play an advisory role on issues relevant for social partners at the local level. Wages, including the minimum wage; pay increase indicators in the state budget sector; pensions and allowances included in the Social Insurance Institution (ZUS); minimum income level; income criteria for social policy interventions; and the level of family allowances. Other issues can be covered as well. All issues requiring the reconciliation of social partners’ interests with regard to sectoral problems. State economic policy and the labour market; labour law and collective bargaining agreements; social dialogue development; social insurance; public services; the budget, wages and social benefits; cooperation with the International Labour Organization (ILO); European Structural Funds; the revised European Social Charter; EU affairs, civil service and local government employees. All issues within the remit of trade unions and employer organisations at the local/regional level, in particular related to maintaining social peace and mediating in local industrial conflicts. The main channel of workplace-level employee representation is provided by company-level trade union organisations (zakładowe organizacje związkowe). In order to set up a new company-level union, at least 10 members are required, who subsequently need to notify the court of law so that the new union is registered. Employees working at separate workplaces (for example, multi-establishment companies) can found an intercompany trade union organisation (międzyzakładowe organizacje związkowe), but those are relatively rare. Workplace-level unions either directly belong (as in the case of NSZZ ‘Solidarność’, as it is a general workers’ union) or are associated with sectoral and/or regional structures. Works councils have existed since 2006. In order to establish a works council, at least 10% of employees working for the employer need to request an election (general ballot) to the body. The works council is elected for a four-year term. Between 2006 and 2008 the threshold for establishing a works councils was 100 employees. Currently, employers with at least 50 employees have to allow a works council to be established. Until 2009, the law envisaged two paths for the establishment of a works council: in non-unionised workplaces a council would be elected in a general ballot, while in unionised ones the councillors were to be appointed by company-level trade unions. In 2008 the Constitutional Court ruled that those regulations breached the Constitution. Following the amendment in 2009, all works councils come from general elections, but in unionised workplaces, unions generally have managed to maintain control over the bodies. In the figure, we see a comparison between Poland and European Union for the people with 'Establishment size : All' when asked 'Official structure of employee representation present at establishment'. For the 'Yes' answer, Poland's score is lower than the European Union score. For the 'No' answer, Poland's score is higher than the European Union score. The National comparisons visualisation presents a comparative overview for the values of all answers between two selected countries. The central concern of employment relations is the collective governance of work and employment. This section looks into collective bargaining in Poland. Collective bargaining takes place mainly at the company level. However, company-level collective agreements require the existence of trade unions, which limits the collective bargaining coverage in the Polish context. Collective agreements at sectoral level in Poland are very rare. At national level, there is the Social Dialogue Council (RDS), whose responsibilities include setting the wage growth indicator for companies and the public sector. RDS also sets the statutory minimum wage rates. Collective agreements are legally binding. The party that is authorised to conclude a collective agreement cannot refuse to enter into collective bargaining if it aims at concluding a new collective agreement or if the change in an existing collective agreement is required because of a significant change in the economic situation of an employer or the worsening situation of employees. The process of decentralisation and the abandonment of the supra-company and sectoral collective agreements have become a permanent trend in the industrial relations system. According to European Company Survey data, wage bargaining at the company level covers 50% of the establishments/companies with 10 or more employees studied in the ECS, while 10% of entities studied were covered by ‘occupational level’ wage bargaining. The average for all levels was 54%. Sources: Eurofound, European Company Survey 2013 (ECS), private sector companies with establishments >10 employees (NACE B­–S) – multiple answers possible; Eurostat, Structure of Earnings Survey, companies >10 employees (NACE B–S), single answer: more than 50% of employees covered by such an agreement. For more information on the methodology, see here. There are no systematic administrative or survey data on the coverage of collective agreements and their evolution over time in Poland. According to the last published report of the National Labour Inspectorate (Państwowa Inspekcja Pracy, PIP), in 2015 a total of 60 single-employer collective agreements covering 101,000 employees were registered (around 0.4% of employees), compared to 88 single-employer collective agreements covering 43,000 employees registered in 2014. At the same time, there was a constant decline in the number of protocols to the existing agreements (which are a way of renewing or changing them) registered (2,830 protocols in 2009 and only 909 in 2015). Taking into account that only a small fraction of companies are covered by collective agreements of any kind, it is quite likely that the ECS and SES results are overestimated and that the question asked during the interview was understood by interviewees in terms of the existence of any kind of company-level pay regulation which is collectively agreed, even if the latter has no status as a registered collective agreement, such as pay regulation (regulamin wynagradzania). Another level, is the multi-employer level. The number of multi-employer collective agreements is decreasing and no genuinely new multi-employer agreements were concluded in recent years. In 2017, 86 multi-employer collective agreements registered by the Ministry of Family, Labour and Social Policy (Ministerstwo Rodziny, Pracy i Polityki Społecznej, MRPiPS) were in force, of which 76 covered administrative and technical employees in educational institutions (except for teachers). There is no current data on the number of workers covered by multi-employer agreements, but as of 2013, they covered 390,000 employees (some 2.7% of employees). The latest data included in the ICWTSS database 5.0, based on the Polish labour inspectorate reporting, suggest that the adjusted collective wage bargaining coverage in Poland in 2012 amounted to 14.7%. The main level for any collective negotiations of wages and working time is the company level. However, instead of concluding collective wage agreements, employers usually prefer to draw up in-house remuneration rules (pay regulations), as mandated by the Polish Labour Code for entities employing at least 20 people (Clause 77/2(1) of the Labour Code). If there are unions present, then pay regulations are subject to bilateral agreement. In smaller entities, remuneration issues are regulated by individual employment contracts between the employer and individual employees. In theory, it is also possible to negotiate wages and working time through multi-employer collective agreements, but this possibility is rarely used in practice. At the national level, the minimum monthly wage is negotiated on an annual basis within the RDS . The legislation that links various collective bargaining levels is rather poorly developed in Poland. The most relevant provision of the Labour Code (Clause 9(2)) says that the stipulations of company-level and multi-employer collective agreements and any regulations at the company level cannot be less advantageous to workers than the Labour Code. According to Clause 9(3) of the Labour Code, the rules (including in-house remuneration rules) and statues introduced at the company level cannot be less beneficial to workers than collective agreements. No data are available on the timing of company-level and multi-employer collective bargaining. by 15 September, the prime minister announces the minimum wage rate. There is no central mechanism of wage bargaining coordination in Poland. In practice, the only legally set threshold for wage bargaining is the minimum wage. Given the lack of multi-employer wage agreements in most sectors, the relevance of formal horizontal coordination is limited. Clause 241/18 of the Labour Code states that multi-employer collective agreements can be extended by a decree of the Ministry of Family, Labour and Social Policy (Ministerstwo Rodziny) to employers that are not affiliated to the signatory employers’ organisations following a joint request of an employers’ organisation and a multi-employer trade union. However, this legal opportunity is not used in practice as multi-employer collective agreements are very rare in Poland. In addition, Clause 241/10(1) of the Labour Code makes it possible for parties who are entitled to conclude a collective agreement to apply an existing collective agreement (or a part of it) that they did not conclude. There is no information about the scope of such extension procedures in practice. In addition, Clause 241/9(3) of the Labour Code gives the parties of a collective agreement the right to allow a trade union that was not a party of the collective agreement to join it. By virtue of Clause 241/27 of the Labour Code, company collective agreements and multi-employer collective agreements, or their parts, can be suspended by signatory parties for a period no longer than three years due to economic difficulties of the employer. According to the most recent report of the National Labour Inspectorate (Państwowa Inspekcja Pracy, PIP), the number of agreements to suspend a collective agreement due to the economic problems of employers declined from 130 in 2010 to 85 in 2011, 76 in 2012 and 74 in 2013. There is no information about the sectoral coverage of the suspensions. Collective agreements can be concluded for a definite or indefinite period of time. The agreements can be dissolved based on the unanimous declaration of both parties or at the end of the period for which an agreement was concluded. Alternatively, the agreements can be terminated if one party gives notice (usually three months). If collective agreements expire and are not renegotiated, they cease to be legally binding. There are no peace clauses in collective agreements. In general, there is no information about the content of collective agreements except for the brief reports of the National Labour Inspectorate (PIP). According to the 2014 annual report, the range of topics tackled by single-employer collective bargaining rarely goes beyond the issues of wages and exceeds the minimal provisions of labour law. In the 2015 annual report, no such specification is offered. In 53 (out of 88) collective agreements registered in 2014, seniority bonuses were provided, and in 59 there are better regulations of retirement gratuities than in the general legislation. There were also cases of additional bonuses for night work (22), overtime (10) and work on Sundays and bank holidays(15). while making the decision to initiate a strike, the employee representation in the collective dispute should take into consideration whether demands addressed are proportional to the potential losses the strike can cause. A strike can be called despite not meeting the above-mentioned conditions if the employer’s unlawful actions prevented negotiations or mediation, and also if the employer dissolves the employment relationship with the leader of the strike. A collective dispute (spar zbiorowy) is an industrial dispute that emerges as a result of a disagreement between the employee representation (trade unions) and employer over such issues as working conditions, pay or social benefits and rights and freedom of association of employees or other groups of workers entitled to trade union membership. Certain occupational groups do not have the right to enter into collective dispute: policemen and functionaries of the Border Guard, State Penitentiary Service, State Firefighting Service and the Superior Chamber of Control (state auditor). If the mediation process does not appear to be leading to a resolution of the collective dispute within the legal timeframe (the ‘grace period’ of two weeks for seeking a resolution of the dispute by means of negotiations and/or mediation), the union organisation that has initiated the collective dispute has a right to call a one-time warning strike lasting no longer than two hours. To defend the rights and interests of employees who do not have the right the strike, trade unions in other workplaces can initiate a solidarity strike lasting no longer than half a working day. The law stipulates that other forms of industrial action can be resorted to if the legal proceedings envisaged by the law for the collective dispute resolution produced no result, despite having been duly performed. Those ‘other forms of protest action’ are not explicitly named but have to meet the following conditions: they cause no harm to health and life, cause no interruption of work and do not violate the law. Employees who do not enjoy the right the strike can resort to those ‘other forms of protest action’ too. Farmers have a right to protest according to specific rules set by the farmers’ trade unions. There are other forms of industrial action not named explicitly by the law but recognised in the official reporting and domestic literature: work-to-rule, refusal to do overtime, work stoppage, blockade, occupation and hunger protest. Employees working for the state, central government administration, local public administration, courts of law and public prosecutor offices do not enjoy the right to strike. Furthermore, there are a number of workplace types where no strikes are allowed, including the police, armed forces, intelligence, Border Guard, State Penitentiary Service, Customs and firefighting units. Negotiations: The parties to the collective dispute negotiate on their own to seek a resolution of the dispute. Mediation: Following the failure of negotiations, the parties request that a mediator (from the official list of mediators maintained by the Ministry of Family, Labour and Social Policy ) is appointed by mutual consent of both parties. If the parties are unable to consent, the mediator is appointed by the Ministry unilaterally. Arbitration: If the mediation is unproductive, instead of calling a strike (to which they are entitled), the employee side may request that the dispute is settled by the Collegium of Social Arbitration (Kolegium Arbitrażu Społecznego), a special organ of a court of law. Goodwill mission: A special dispute resolution path for settling rows in employment relations which for legal reasons (the scope of issues to be subjected to collective disputes is explicitly named by the law) cannot escalate into a formal collective dispute. Goodwill missions can be carried out by the regional social dialogue council (WRDS). 1. Judicial: Before labour courts, which recognise cases and resolve disputes authoritatively. by mediation at the request of the employee or the employer, who may seek to resolve the dispute in such a way before going to court (mediation may be undertaken even while the case is in court). Mediation of this kind is regulated not by labour law, but by civil law. Note: No data on the number of disputes and disagreements being settled by means of arbitration and goodwill missions are available, but the Ministry states that the occurrence of the former is very rare and no information on the latter is accessible. Source: Ministry of Family, Labour and Social Policy, Monitoring konfliktów społecznych. Individual employment relations are the relationship between the individual worker and their employer. This relationship is shaped by legal regulation and by the outcomes of social partner negotiations over the terms and conditions governing the employment relationship. This section looks into the start and termination of the employment relationship and entitlements and obligations in Poland. In line with Clause 65, item 3 of the Constitution and Clause 190 of the Labour Code, the minimum working age is 16 (on 1 September 2018 it will be lowered to 15 years of age). Entering an employment relationship requires a written contract that specifies the parties of the contract, the place of performing work, remuneration and its components, working time and the starting date of work (Clause 29(1) of the Labour Code). The written employment contract has to be issued at the date of commencing work at the latest. by completion of work for which the contract has been concluded. In case of non-fixed employment contracts, length of notice depends on the work span of the employee (if the person has been employed for at least three years, the notice runs for three months). When the contract is terminated with notice by the employer, the employee has a right to time off for the purpose of seeking new employment (two days, if the notice runs for less than three months and three days if the notice is three months). In the case of union members, employers are obliged to notify the union about their intention and to give grounds for termination of the contract before giving notice. Employment contracts cannot be terminated for employees who are less than four years away from retirement age (pre-retirement protection). Employees can be dismissed on disciplinary grounds (Clause 52 of the Labour Code) following a serious breach of their employee obligations, a criminal offence resulting in a court sentence or by losing their professional certification due to their own misconduct. At collective level, redundancies are subject to a separate regulation (the Act on Collective Redundancies). Parents in Poland can benefit from maternity leave, parental leave and paternity leave. According to the data from the Social Security Institution (ZUS), paternity leave is becoming more popular in Poland: in November 2016, there were 17,300 fathers on paternity leave compared to 14,100 at the end of 2015, 14,100 at the end of 2014, and 2,200 in December 2013. 20 weeks (14 of them are reserved for mothers, after which time fathers can use the six weeks that are left, instead of the mother). Maximum six weeks can be used before the birth of the child. The duration of basic maternity leave is longer in case of giving birth to twins (31 weeks), three children (33 weeks), four children (35 weeks) or five or more children (37 weeks). If a woman gives birth to one child, she can apply for an additional six weeks of maternity leave; in case of twins the leave can last for eight weeks. 100% of basic pay (salary) for 26 weeks’ leave. 80% of basic pay (salary) for 52 weeks’ leave. The Social Security Institution (ZUS). In with more than 20 employees, it is paid by the employer (from the contributions paid to ZUS). 60–80% of basic pay (salary). In companies with more than 20 employees, it is paid by the employer (from the contributions paid to ZUS). 14 days (including Sunday and Saturday). It can be used from the birth of the child until he or she is one year old. 100% of basic pay (salary). Issues related to sick leave are subject to regulation by the Act on Financial Benefits Related to Illness and Maternity Paid by Social Security. While on sick leave, employees are entitled to a sick leave allowance (in general, it amounts to 80% of the regular pay, with the exceptions of sick leave collected during pregnancy, resulting from accidents that occurred on the way to or from work or if undergoing medical examination or procedures involving donating cells, tissues or organs (100% equivalent of the benefit amount) or staying in the hospital (generally 70% of the regular pay). not present at work) (Clause 41 of the Labour Code). It is also possible to terminate the employment relationship in case of employees who are on sick leave longer than three months and were previously employed for less than six months (Clause 53/1(1a) of the Labour Code). Until 1 January 2013, the retirement age for men was 65 and 60 for women. On1 January 2013, the retirement age was raised to 67 for both women and men. In practice, the retirement age was due to increase by three months every year. In late 2016, the reform was overturned by amending the Act on Pensions, so the former conditions (65 and 60) came into force again in October 2017. Pay: For workers, the reward for work and main source of income; for employers, a cost of production and focus of bargaining and legislation. This section looks into minimum wage setting in Poland and guides the reader to further material on collective wage bargaining. The national minimum wage is set annually in accordance with the Minimum Wage Act of 2002. The Social Dialogue Council (RDS) determines the wage for the next year based on proposals submitted by the government. The decision has to be made unanimously by the social partners and the government. The figure proposed by the government must not be less than the current minimum wage, adjusted to the Consumer Price Index (CPI) forecast for the next year. If the current minimum wage is lower than 50% of the national average pay, the following year’s proposed minimum wage also has to be increased by two-thirds of the percentage growth in GDP forecast for the following 12 months. If the RDS fails to reach consensus, the government takes the decision unilaterally, yet the wage cannot be lower than the original proposal. In 2016, the minimum wage increase for 2017 agreed in RDS was further raised by the unilateral decision of the government, the first such case since the inception of the Minimum Wage Act. In 2018, social partners failed to agree the minimum wage increase, so the ultimate decision was taken by the government. Collective bargaining is highly decentralised and plays a marginal role in wage setting. There is no consolidated data source on single-employer collective agreements to which one could refer when searching for collective bargaining-related pay outcomes. In general, decisions on pay adjustments are taken unilaterally by employers. Working time: ‘Any period during which the worker is working, at the employer’s disposal and carrying out his activities or duties, in accordance with national laws and/or practice’ (Directive 2003/88/EC). This section briefly summarises regulation and issues regarding working time, overtime, part-time work as well as working time flexibility in Poland. The statutory weekly working time is subject to regulations of Chapter 6 of the Labour Code and amounts to 40 hours. The maximum working week including overtime cannot exceed 48 hours (in line with Directive 93/104/EC and the amended Directive 2000/34/ EC). In general, the working time should respect the statutory rest breaks in Poland, which are regulated in Chapter 3 of the Labour Code. Clause 132 says that employees have a right to 11 hours of rest a day. Clause 133 further stipulates that employees are entitled to a 35-hour undisturbed break per week, which also includes 11 hours of rest per day. Chapter 6, Part 4 of the Labour Code introduces various special systems and schedules for the organisation of working time, which can be used depending on job and work organisation requirements. Besides the basic working time schedule (eight hours per day), there are also regulations that allow for exceeding the norm of eight hours per day and 40 hours per week, task-based systems, interrupted working time systems, shortened working week and weekend work systems. Except for shortened working week and weekend work systems, which need to be introduced in an individual contract, other working time systems can be based on collective agreements or general work regulations introduced by an employer. According to the Labour Code (Clause 151), overtime is work performed beyond the statutory limits of weekly working time (40 hours) and work performed beyond the extended 24-hour working time limit of eight hours, reflecting the existing system and schedule of work. It can be introduced in the case of a necessary rescue operation in order to protect human life or health, to protect property or the environment, to repair a breakdown, or in the case of specific employer requirements. The number of overtime hours worked in connection with specific employer requirements cannot exceed 150 hours in a given calendar year for an individual employee unless another (lesser) limit is specified in a collective agreement, work regulations or individual contract. In general, compensation for overtime work can be done through additional remuneration or time off in lieu. The employee is entitled to additional remuneration for daily overtime which equals to 100% of their normal remuneration in case of overtime work performed at night, on Sundays and public holidays which are not his or her normal working days, as well as on holidays offered to an employee in exchange for work on Sundays and public holidays and in case of any overtime performed beyond the statutory weekly working time (40 hours). In other cases, 50% of the normal remuneration is paid. Part-time work in Poland is defined as working hours that amount to less than the statutory 40 hours per week. It is regulated by the Labour Code, including the rules of minimum remuneration, annual leave and non-discrimination against full-time employees with respect to wages, working conditions, access to training, career and skill development. Individual contracts of part-time employees should also include the specification of weekly working time organisation and overtime arrangements. The share of part-time employees in Poland declined from 6.9% in 2012 to 6.3% in 2017. Low wages and the popularity of civil law contracts, which offer more advantages for an employer compared to standard part-time contracts, might explain the relatively modest expansion of part-time work in Poland. As the data in the table above clearly indicates, part-time employment is rather unpopular in Poland in general (three times fewer employees work part time in Poland than in the EU28 in comparative terms). It is commonly understood that the main reason is to do with insufficient earnings from working part time only. According to Clause 151/7 of the Labour Code, ‘night’ is defined as hours ranging from 21.00 to 7.00. An employee whose timesheet includes at least three hours falling into this period, or for whom at least a quarter of work performed in a specific reference period falls into the night period, is considered a to be a night worker. Shift work is defined by Clause § 2.1 of the Labour Code as work performed under specific a work schedule which determines rotation of work between employees in a specific sequence of hours/days/weeks. In general, work on Saturdays is treated just like work on other working days, unless it is a free day for the employee under the work organisation system exercised by the employer (operations run from Monday to Friday). When Saturday is a free day for the employee, the employer’s request that the employee reports for work is valid only in the case of an emergency or if the specific needs of the employer necessitate it. Employees performing work on a Saturday, which is a free day for them, can claim a day off in each case as a compensation. Sundays and bank holidays are free days per se. Sundays or bank holidays begin at 6.00 until 6.00 the next day. Work on Sundays and bank holidays are exception allowed in the following circumstances: due to the system of work organisation (work in a continuous workflow, shift work, or ‘weekend work system’, a special arrangement in which a person works part time only on Fridays, Saturdays, Sundays and bank holidays), due to the nature of work (transport and communication, necessary maintenance, on-site company fire service and rescue service, security services, agriculture, services provided with the use of electronic means of communication, on condition the day is a working day at the location of the employer), due to the specific needs of employers (emergency rescue missions, protection of physical assets or environment, restoring operations after technical failures), due to specific social value or daily needs of the community (municipal services, hotels, restaurants, catering, personal services, health-care services, social assistance, culture, tourism, leisure, retail and wholesale). If an employee works at least six hours a day, they are entitled to a 15-minute break included in the daily working time. Whether the employee works full- or part-time is irrelevant. A lunch break can be introduced (up to 60 minutes), and they are neither included in the daily working time nor subject to extra remuneration. Employees are entitled to at least 11 hours of continuous rest per day and 35 hours of continuous rest per week. The most important developments with regard to working time flexibility took place in Poland in 2013, involving changes in the Labour Code and the Trade Union Act (in force since 23 August 2013). The changes introduced regulations that enable employers to introduce a one-year reference period for calculating working time instead of four months, as long as it is justified by objective, technical or organisational reasons. In unionised workplaces in which company-level collective agreements exist, a new reference period needs to be included in the collective labour agreement ( układ zbiorowy pracy) or introduced by a weaker form of an agreement with trade unions ( porozumienie zbiorowe). In non-unionised workplaces, the introduction of a longer reference period requires an agreement with the ad hoc worker representatives elected according to the customary rules in a given workplace. In the same legislative reform, flexitime was introduced in the Labour Code. It includes a possible variation in the time when work should start during the working day and the definition of the time span in which an employee decides to start his or her work. Both issues can be introduced either in the same way as the one-year reference period or based on an individual written request from an employee. In addition, it is possible to introduce weekly working schedule variation which covers a period of a minimum of one month (Clause 129(3) of the Labour Code). In the figure, we see a comparison between Poland and European Union for the workers with 'Age : All' when asked 'Do you have fixed starting and finishing times in your work?'. For the 'No' answer, Poland's score is lower than the European Union score. For the 'Yes' answer, Poland's score is higher than the European Union score. Data is based on question 39d from the sixth European Working Conditions Survey (2015).The National comparisons visualisation presents a comparative overview for the values of all answers between two selected countries. Maintaining health and well-being should be a high priority for workers and employers alike. Health is an asset closely associated with a person’s quality of life and longevity, as well as their ability to work. A healthy economy depends on a healthy workforce: organisations can experience loss of productivity through the ill-health of their workers. This section looks into psychosocial risks and health and safety in Poland. The number of workplace accidents decreased dramatically between 2008 and 2009. That favourable change was somewhat mitigated in the following years, as the volume of working time lost due to accidents rose between 2010 and 2011, only to shrink again in 2012. Overall, the situation seems to have been relatively stable. Chapter 2 of the Labour Code deals with equal treatment in employment. Furthermore, in February 2014, six nationwide representative social partners’ organisations (except BCC) signed the autonomous agreement on combating work-related stress. The agreement was formalised in April, and subsequently the signatory parties inaugurated the autonomous committee on psychosocial risks. In the figure, we see a comparison between Poland and European Union for the workers with 'Age : All' when asked 'Do you have enough time to get the job done?'. For the 'Always or most of the time' answer, Poland's score is higher than the European Union score. For the 'Rarely or never' answer, Poland's score is lower than the European Union score. For the 'Sometimes' answer, Poland's score is higher than the European Union score. Data is based on question 61g from the sixth European Working Conditions Survey (2015).The National comparisons visualisation presents a comparative overview for the values of all answers between two selected countries. Skills are the passport to employment; the better skilled an individual, the more employable they are. Good skills also tend to secure better-quality jobs and better earnings. This section briefly summarises the Polish system for ensuring skills and employability and looks into the extent of training. In Poland, the national system for ensuring skills and employability is based on a public institution called the Examination Board ( komisja egzaminacyjna), which is responsible for skills validation and recognition. There are eight district Examination Boards, supervised by the Central Examination Board. A dual education system exists in Poland, albeit in a rudimentary form, as it is limited to the field of crafts. As a result, the Polish Crafts Association (Związek Rzemiosła Polskiego, ZRP) is the most deeply involved organisation among the national- level social partners as far as the national system is concerned. The modernised National Framework of Qualifications (Krajowa Rama Kwalifikacji), which is intended to be compatible with the European Framework of Qualifications, has been implemented. In late 2015, the Act on the Integrated System of Qualifications was passed into law. The education system in Poland is supervised by the Ministry of National Education (Ministerstwo Edukacji Narodowej, MEN). However, other institutions are responsible for training regulation and development. They include, most notably, the Labour Market Council (Rada Rynku Pracy) by the Ministry of Family, Labour and Social Policy (MRPiPS), which replaced the Central Employment Council (Naczelna Rada Zatrudnienia), and labour market councils at regional (voivodship) and district (powiat) level, which replaced employment councils ( wojewódzkie and powiatowe rady zatrudnienia) in 2014 (the new institution has been operating since 1 January 2015). The Labour Market Council is composed of nationally representative trade unions and employers’ organisations, a joint committee of central government and self-government as well as the representatives of science and non- governmental organisations. The Council plays an advisory role to the Ministry of Family, Labour and Social Policy with respect to developing measures aimed at full and productive employment and the development of human resources, elaborating National Action Plans and assessing the activity of the National Training Fund. The National Training Fund (Krajowy Fundusz Szkoleniowy, KFS) commenced its operations in 2014. KFS is a special part of the Labour Fund dedicated to upgrading the skills and qualifications of people in employment. Until the end of 2015, KFS use was restricted to people aged 45 and more; afterwards it has become available to everyone. Interestingly, there is some correlation between the existence of workplace representation at establishments and employees receiving paid time off for training. Workplace representation seems to support the access to training within paid time off for 20–80% of employees. In the figure, we see a comparison between Poland and European Union for the workers with 'Age : All' when asked 'Have you had on-the-job training in the last 12 months?'. For the 'No' answer, Poland's score is lower than the European Union score. For the 'Yes' answer, Poland's score is higher than the European Union score. Data is based on question 65c from the sixth European Working Conditions Survey (2015).The National comparisons visualisation presents a comparative overview for the values of all answers between two selected countries. For Poland, the European Company Survey 2013 shows that between 2010 and 2013, 40% of establishments with 10 or more employees reported changes in the use of technology, 40% introduced changes in ways to coordinate and allocate the work to workers and another 14% saw changes in their working time arrangements. In 2015, the 14th edition of the ‘Responsible business in Poland: Good practices’ (‘Odpowiedzialny biznes w Polsce. Dobre praktyki’) annual report was released by the Responsible Business Forum (Forum Odpowiedzialnego Biznesu). Of the continuous initiatives in that field, the following should be mentioned: the implementation of the Charter of Labour Relations by Volkswagen Poznań. In the figure, we see a comparison between Poland and European Union for the workers with 'Age : All' when asked 'Are you able to choose or change your methods of work?'. For the 'No' answer, Poland's score is higher than the European Union score. For the 'Yes' answer, Poland's score is lower than the European Union score. Data is based on question 54b from the sixth European Working Conditions Survey (2015).The National comparisons visualisation presents a comparative overview for the values of all answers between two selected countries. The fundamental regulation dealing with the issues of equality and non-discrimination at work is Chapter 2a of the Labour Code. Furthermore, Clause 94/3, item 2 of the Labour Code defines and prohibits mobbing. There are no bodies in place specifically designed to combat discrimination at work, but there are institutions whose remit covers equality and non-discrimination in general (the field of work and employment is also encompassed), such as the Ombudsman (Rzecznik Praw Obywatelskich) and the government’s Plenipotentiary for Civic Society and Equal Treatment (Pełnomocnik ds. Społeczeństwa Obywatelskiego i Równego Traktowania). Because equality and non-discrimination at work is subject to Labour Code regulation, the National Labour Inspectorate (PIP) is involved too. Gender-related pay discrimination is prohibited. Nevertheless, the gender pay gap is persistent. In February 2014, the national auditor (Najwyższa Izba Kontroli, NIK) issued a report on pay inequalities between men and women. Statistical analysis of earnings of more than 120,000 people working on the basis of employment contracts in the public sector (about half of whom were women and half were men employed in comparable positions) revealed that on average, women earn 10.82% less than their male colleagues. The gap almost doubled between 2006 and 2007 (7.5% to 14.9%), then fell dramatically to 4.5% in the period 2007–2010 and began to stretch again from 2010–2012, but at a moderate pace (by 1% annually). No such regulations are in place in Poland. Bechter, B. Brandl, B., Meardi, G. (2012), ‘Sectors or countries? Typologies and levels of analysis in comparative industrial relations’, European Journal of Industrial Relations 18(3): 185-202. Gardawski, J. (2003), Konfliktowy pluralizm polskich związków zawodowych [Competitive pluralism of Polish trade unions], Friedrich Ebert Foundation, Warszawa. King, L.P. (2007) ‘Central European Capitalism in Comparative Perspective’, in B. Hanké, M. Rhodes and M. Thatcher (eds. ), Beyond Varieties of Capitalism: Conflict, Contradictions and Complementarities in the European Economy. Oxford: Oxford University Press, 307–327. Meardi, G. (2002) ‘The Trojan Horse for the Americanization of Europe. Polish Industrial Relations Towards the EU’, European Journal of Industrial Relations, 8 (1): 77–99. Ost, D. (2000), ‘Illusory corporatism in Eastern Europe: Neoliberal tripartism and postcommunist class identities’, Politics & Society, Vol. 28, No. 4, pp. 503–530.